Seth Perry joined the Princeton faculty in 2014. He is interested in American religious history, with a particular focus on print culture and religious authority. Perry’s first book, Bible Culture and Authority in the Early United States (Princeton University Press, 2018) explores the performative, rhetorical, and material aspects of bible-based authority in early-national America. 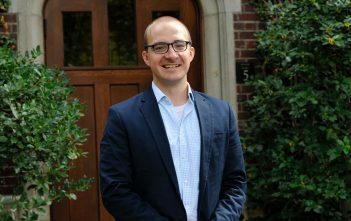 His other recent work includes “The Many Bibles of Joseph Smith: Textual, Prophetic, and Scholarly Authority in Early-National Bible Culture” in the Journal of the American Academy of Religion and “Scripture, Time, and Authority among Early Disciples of Christ” in Church History. His current book project is a biography of Lorenzo Dow, the early-national period’s most famous itinerant preacher (his article on Dow appeared in 2015). Perry’s work has appeared in the Chronicle of Higher Education, Common-place, The Huffington Post, and the LA Review of Books. Wake Forest University, February 6, 2015.